The new private players in urban transportation have learned to be careful about appearing to oppose public transit — at least, most of the time. Uber is making a point of supporting some of the biggest transit tax proposals in the country. Lyft wants you to know that they’re “friends with transit.” These companies know that they rely on an urban, educated political base — people who can figure out for themselves that shifting lots of people from big vehicles into small ones is not the way to improve congestion, emissions, or pretty much anything that matters. Still, the hype coming off the technology companies — even when not explicitly hostile to big-vehicle transit — feeds a vague notion that “innovation” will somehow sweep transit away. And this attitude is damaging transit systems now. To make this claim I’ve usually had to refer to my personal experience as a consultant — and especially my constant conversations with local stakeholders and opinion leaders. But right now, we have some examples, from the websites of opponents of transit proposals around the US. My point in citing these is not to defend particular transit proposals. We don’t endorse here. And it doesn’t matter, to my point, which measures pass and which fail. 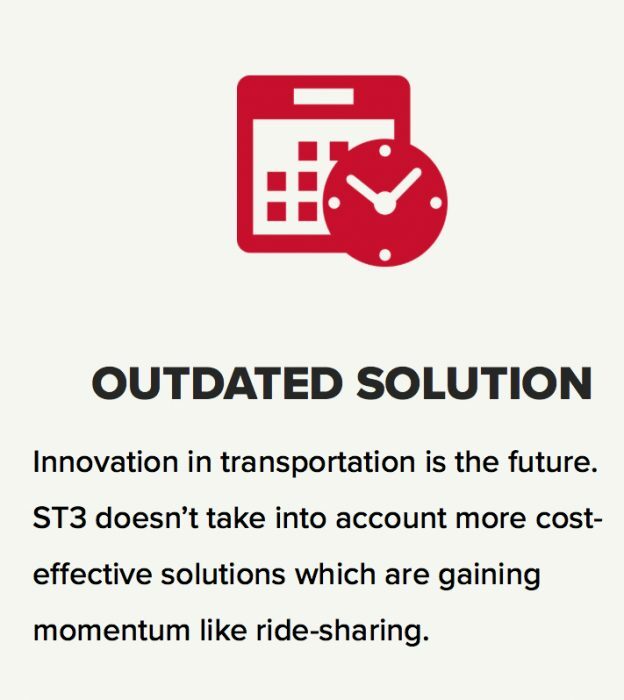 My point is that tech industry PR, with its meme of “innovation” somehow changing everything, is now a key source of anti-transit rhetoric. If voters approve the transit referendum Nov. 8th, Indianapolis will buy a quaint 1940’s solution to a 21st Century opportunity. When Uber and Lyft – the transportation innovation leaders of today — are initiating a transportation revolution in other communities, Indianapolis once again looks in the rear-view mirror. Indianapolis leaders, IndyGo planners, and taxpayers should be anticipating the flood of change that will occur over the next few years—not building permanent bus lanes down the middle of major city thoroughfares which will be rendered obsolete. Major roads will have lanes closed to create ‘bus only’ lanes – congesting traffic. Cities with bus only lanes also implement priority traffic signal policies that turn stop lights green for approaching buses and red for cross traffic – further delaying motorists. The proposal spends billions on old transit tech like buses and rail while other cities are contracting out transit services to Uber, Lyft, Chariot and others that provide door-to-door service at substantial savings. Yes, there may be breakthroughs, which may have the outcomes we hope for, and this is reason enough to declare our existing tools to be “dinosaurs.” The idea is that future inventions should destroy useful things today. It’s completely understandable that inventors want us to think this. If we throw away our existing solutions to urban problems, we will be even more dependent on their inventions, which will be good for them. That’s why we must lean into the wind, being skeptical but not cynical about the good things invention may bring. Why should we continue to invest in big-vehicle, space-efficient public transit, and protect what we have from degradation, when all this innovation may occur? Technology never changes geometry. 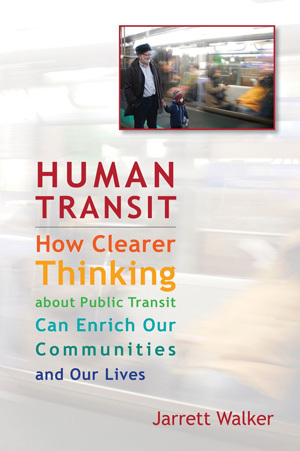 In dense cities, the efficient use of space requires continuing to move large numbers of people in large vehicles, which is what successful urban transit networks are. (The story may be different in low-density suburban areas, where demand is sparser and space is more abundant, especially if those places don’t intend to grow denser.) The only way to move large vehicles efficiently and also attractively is first to run them frequently, and second, where possible, to protect them from traffic congestion. Yes, this may get in the way of your car. Making something easier causes more people to do it. This is how autonomous cars could cause an explosion of vehicle trips that would overwhelm any space-saving benefits of the technology, congest our cities to the point of dysfunction, and thus trigger a new generation of urban sprawl. Do you believe that autonomous cars will radically expand your liberty, even in the densest cities? Do you imagine that you, a city dweller, will be able to get out into the beautiful countryside more easily, so that you could even buy a cabin in the woods? That’s what the proponents of cars wanted you to believe 100 years ago. The problem isn’t that you got those things, but so did everyone else. So the liberty of the motorist became the prison of congestion, and everyone’s cabin in the woods meant there were no woods left. Again, if you’re new to this, autonomous vehicles can be a wonderful thing. The problem is the hype about things uninvented, and the way it encourages us to destroys things that we value, now. Choosing our words: autonomous cars or autonomous vehicles? Personally, I do not buy into the notion of fully autonomous vehicle platforms – it may be that I am just old school. I believe there are just too many variables (things that could potentially go wrong) to contend with in an autonomous automobility realm. So I have a question: how many would feel totally comfortable flying in aircraft operating fully autonomously among an aviation platform where all aircraft are operating likewise and have every confidence that there would be zero collisions (a requirement absolutely, as anything less would be completely unacceptable)? I know I wouldn’t. You see where I’m coming from and where I’m going with this – right? My take: Autonomous mobility is best left to fixed guideway-type platforms. Once this is perfected, then, and only then, can we talk about the capability for non-fixed guideway platforms … maybe. Fixed guideway-type platforms, this has been solved for over 30 years, by many metro systems around the world. We absolutely can talk about non-fixed guideway platforms now. The last 15 years, fully automated plans would have provoked exactly one plane crash, that was saved by a hero. They even recently made a movie about it. Automats would never have saved the day. They would have avoided plenty of other crashes, like the A320 that was pushed into the mountains by the pilot, o this ATR72 that had an engine in fire – and the pilot did mistakenly turn off the wrong engine. Or the SSJ prototype thrown in the mountain because the pilot thought the alarm was defective. Or the Tupolev that crashed in Smolensk, because the pilot was not allowed by a high-ranking passenger to obey the control tower, and go land elsewhere. Etc…..
deliver in transit capacity terms. and wait until the passenger returns to ride back. change related to how many car owners would switch to sharing. driving beyond median affordability, but this is aggressive policy. populated area what is a controversy. cars on their ride into an area are harder to imagine in their fruits. in there but only if everyone in the car used to drive independently. it already had to do it. private space bubble with you is not anyone would willingly enjoy. soluble in any of the cases I imagined. Can anyone please explain how “ride-sharing” is anything more than investor-subsidized taxi service? Re the Seattle comment, the Ubers and Lyfts take up scarce TIME as well as space. They often load in bus lanes and zones (during rush hour) and can take as much time to find and load one or two passengers as a bus stopping to pick-up ten people.